St. Louis-style pizza is a distinct type of pizza popular in the Midwestern American city of St. Louis, Missouri and surrounding areas. The definitive characteristics of St. Louis-style pizza are a very thin cracker-like crust made without yeast, the common (but not universal) use of Provel processed cheese, and pizzas cut into squares or rectangles instead of wedges. The thin, cracker-like round crust is made without yeast, as opposed to a deep dish Chicago-style pizza or the thin but leavened New York-style pizza. The crust of a St. Louis pizza is somewhat crisp and cannot be folded easily so the pizza is typically cut into three- or four-inch squares or rectangles instead of the pie-like wedges typical of many pizza styles. This may be done as the square shape can support the toppings better than wedge slices. Some local restaurants make their pizzas rectangular rather than round. St. Louis pizza is cut into squares and is referred to as party or tavern cut. According to local legend, Ed Imo — founder of a prominent chain of St. Louis pizzerias — was a tile layer and cut his pizza accordingly. St. Louis-style pizza sometimes includes a white processed cheese known as Provel. Provel is a trademark for three cheeses fused to form one (provolone, Swiss, and white Cheddar), used instead of (or, rarely, in addition to) the mozzarella or provolone common to other styles of pizza. Provel cheese was developed by the St. Louis firm Costa Grocery in the 1950s and is made in Wisconsin primarily for the St. Louis market. The cheese is not widely available outside the St. Louis area but can be made by combining Swiss, sharp cheddar and smoked provolone cheeses. The sauce is often seasoned with more oregano than other pizza types. 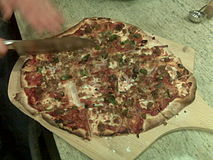 Despite its thin crust, St. Louis-style pizza can be layered deeply with many different toppings because of the sturdiness of the cracker-like crust. Some of the sauces have a sweetness to them, which is likely due to the influence of Sicilian immigrants upon Italian foods in St. Louis. ^ a b c d e Richman, Adam (2010). America the Edible: A Hungry History, from Sea to Dining Sea. Rodale. pp. 79–81. ISBN 1605293024. ^ a b c Viets, Elaine (2011). Death on a Platter: Josie Marcus, Mystery Shopper. Penguin. p. (unlisted). ISBN 1101558733. ^ a b Kim Harwell (2003-01-11). "City famed for arch has another angle; St. Louis-style pizzas square off against all comers". The Dallas Morning News. ^ Barrett, Liz (2014). Pizza: A Slice of American History. Minneapolis, MN: Voyageur Press. ^ Bastianich. (2011). Lidia's Italy in America, New York: Alfred Knopf. ISBN 978-0-307-59567-6. Page 272. ^ Kevin Pang (2007-02-22). "For some pizza lovers, geography matters". The Chicago Tribune. ^ Lemons (2008-01-17). "Imo's Pizza in St. Louis". SeriousEats.com. ^ Bonwich (2007-04-11). "Family ties pave the way to provel's enduring popularity". St. Louis Post-Dispatch. Retrieved 2007-05-11.